A friend of mine suffered a crisis recently when switching her wardrobe over from summer to winter. What should have been a joyful day of rediscovering old pieces quickly turned dark and scary. She completely unravelled at the sight of all those discarded body wrappers tossed together in a massive heap on the floor. It was overwhelming. Where would she put them all? Why on earth did she have so much? In hopeless desperation she threw herself onto the offending pile on the floor, thrashing around violently while screaming out every rancid swear word she knew and some new ones that came to her in her agonizing moment of self realization. A few minutes later she had disappeared, swallowed whole by her clothing addiction. A day later her partner discovered her, partially hidden by a pair of abstract floral leggings and a large fur trimmed mohair coat. She was disoriented and incoherent when she struggled to stand up, mumbling something about a silk chiffon dress trying to suffocate her into submission. She has since taken solace on Instagram where her addiction is not only rampant, but encouraged and applauded. “Why do I hate all of my clothes? When did my closet get so small? What was I thinking when I bought that? It sounds like you are suffering with a severe case of Why, When, What and Who … a very common illness among high functioning hoarders thrifters. There are remedies that can cure this malady that is squeezing your brain and exhausting your energies. Please note: I don’t recommend you consult your physician prior to starting any of these cures, they would be sure to talk you out of them. They’re just doctors! What do they know? A family size bag of extra salted ripple chips with double fat sour cream dip washed down with a full bottle of champagne. Do not try to substitute rice cakes and Perrier. I’ve tried this and it only makes matters worse. Get a large metal bin, go outside, throw all of your clothes into the bin and light them on fire. You may choose to dance around in joy while singing, “I’m a f***ing rock star!” and “Who’s your Momma now?” at this point. Be aware this remedy requires nerves of steel and may lead later to periods of severe remorse, depression and nakedness as you will have no clothes left to wear….literally. You know what they say, if you want to stop a bad habit you need to replace it with something else. That is where Netflix fits in! Put on your coziest PJs, snuggle up to your pug (or human) pick out an 18 episode, 9 season Netflix series and binge watch until you fall into a coma. When you finally wake up it will feel like a bad dream, like that time you drank a two-six of vodka to celebrate your eighteenth birthday, you will have no memory whatsoever. I *may* start on remedy #3 tonight…you know….just to try it out for you to make sure it works. If you don’t hear from me for a month you’ll know that I’m happily coma-ing my way through 9 seasons of The Good Wife in my effort to forget my addiction to compulsive thrifting. 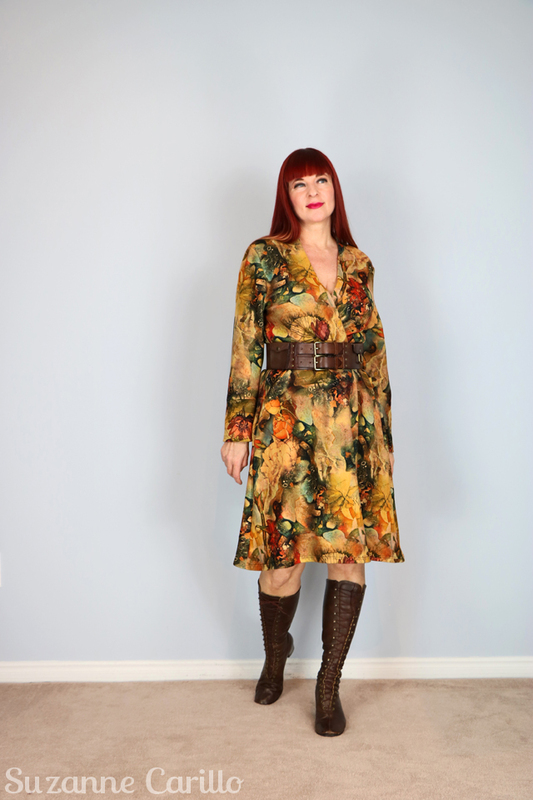 Hi Suzanne, this post was written for me….I have managed to stop my ebay habit and keep too busy to thrift shop but I am feeling overwhelmed by the amount of clothes/lack of storage space I have. I love The Good Wife and Champagne so can I join you? Ha ha! The more the merrier! OH my goodness! I laughed! I think this may be me! LOL! I completely understand and I do love your remedies! I think binge watching a series may be my answer! But on a side note your outfits above are outstanding! I have “friends” like this too Suzanne….. But I recently came upon a solution. I just need to change my outfits about 5 times a day, and then I can make sure that all of my fabulous clothes get the love they deserve….. I agree, it needs to be like in the 1950s where there are morning outfits, early afternoon, mid afternoon and evening outfits. Mind you, I might need a full staff just to keep track of it all. Heaven knows my PA (aka the pug) isn’t up to this kind of pressure. She just came back from an afternoon at the spa and is taking a nap to “recover”. Gotta watch those silk chiffon dresses, they’ll get you every time! Gorgeous body wrapping or not. 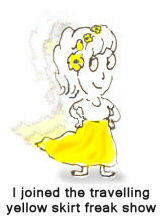 At least we will go out in a blaze of floral, frilly, fiery fabric. What a way to go! I feel your pain girlfriend. Sometimes, thrifting is like certain asanas; they just hurt so good! Ha ha! I know no one believes me but this truly was written on behalf of a girlfriend that was lamenting about her situation. In all honesty I still haven’t switched over my summer dresses to winter and we are well into winter. Oops! Ha ha. I feel lots of things about my clothing but I’ve never gotten to the point where I hate everything in my closet. Thank heavens! Who on earth could you POSSIBLY be writing about, Suzanne?! Ha ha! Glad you saw this! People will now know I’m not making this up! Hope you enjoyed your Netflix fix. mwahah, I’m laughing, but also a little bit scary when reading Remedy2, well, the same idea looks scary!!! And I totally agree on having a ‘series therapy’ to recover from any trauma!. I’ve been watching ‘Victoria’ (not the best series ever, but pretty entertaining and well made!) and my mood is so much better now!! I need to check out Victoria. Lots of people have been talking about it. I loved the Crown. I loved remedy number 3! Or don’t try to replace with Perrier 🙂 I’s true, it was funny reading about the shouting, the partner finding her next day disoriented, but really, it happens. But I liked the idea of battling a bad habit with something else. I loved your outfits, they are always so polished up, so beautiful! Hope you have a very beautiful week! Hugs! I caught and commented on this post before it arrived in my email. This time I followed the link to your Instagram posts (I’m not on Instagram) WOW! WOW!! WOW!!!!! I’m tempted to join. 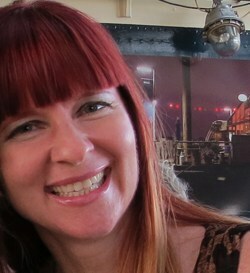 You have collected and sold an amazing array of GORGEOUSNESS!! It was really fun to be a guest on your IG account. Thanks! Yes, IG can be a bit addictive. Like flipping through a magazine non-stop. It can also be a bit mind numbing…but then when social media isn’t? I don’t have time to post all of my treasures that I have for sale on IG or on my blog. I do try to post them on my FB fan page as I’m able to post there directly from Etsy when I list the item for sale. 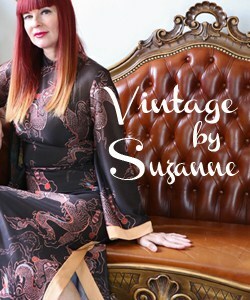 I also try to post them onto my Pinterest vintage clothing for sale board. No one believes me but it really was based on a girlfriend! Ha ha! I’ve never gotten to the point where I hate everything in my closet(s). Now that I have my shop though and vintage clothing has taken over so much of my dining room and basement it can be overwhelming. I’m just grateful that the items for sale and not to be stashed in my bursting closet. I agree…I’m always looking for the elusive *perfect* whatever to upgrade in my closet. Ha ha! Suzanne, this was very funny! On a more serious note though; I do sometimes feel very guilty about my hoard of clothes and it can occasionally spoil my pleasure in them – but not for long. Many people have much more than I do in the way of clothes and all of them have been bought retail. At least 97% of my clothes have been bought from charity shops and those shops have benefitted from my cash and my donations. And I’m recycling and keep things out of landfill. So there, guilt! Ha ha! I hope you did reward yourself Veronica. We are doing our part to help the environment. 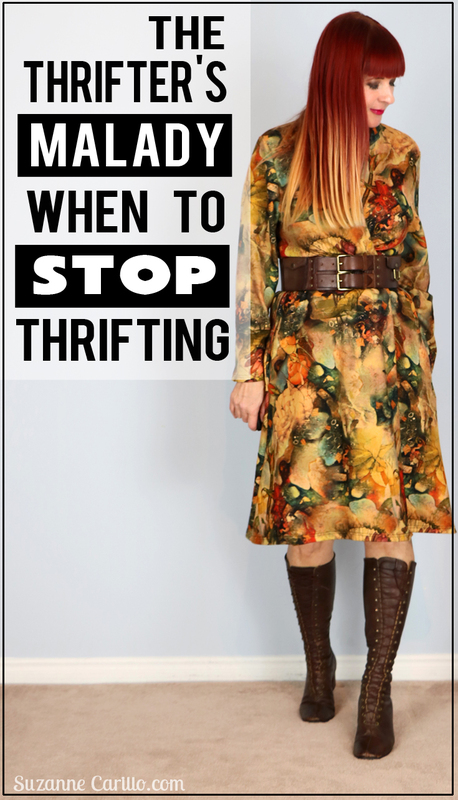 I’m sorry….”stop thrifting??? ?” I don’t understand what those words mean. Ha ha! That would be a someone that is in denial about their addiction. I am all for remedy number one. Well I have a lot of clothes, but I actually enjoy them. If it ever gets to the point where I don’t, I will quickly call Goodwill. ! I consider each piece of clothing as a separate color in the color wheel. I hope that makes sense. That said, I’m not doing as much shopping so used to. I guess I am listening to my very stuffed drawers! No one believes me but this was really written based on an email I wrote to a girlfriend that was lamenting about her situation. I’ve never gotten to the point where I hate my clothes. I’m sure you realize this but let me say it (again): you are a brilliant comic writer. Your prose is so entertaining, so funny. Even if I didn’t have many other reasons to come here (and I do), the laughs would be enough reason. So good! I’m glad you enjoyed it Ally. This was initially an email I wrote to a girlfriend that was losing it over her annual closet switchover. Sometimes emails are great sources for blog content. Oh dear, I have the same addiction. Only substitute the word thrifting by shopping. The rest of your funny story is me. Remedy 1 only lasts for one day. So no good. Remedy 2 is to much for me. I know I will regret it sincerely. Remedy 3 is temporarily too. Do you also have a remedy which will last a year? At the m9ment I am already go8ng from thrift shops to my biggest pitfal shop Essentiel. Haven’t bought anyth8ng. Yet. But what am I doing in there? Don’t you want a remedy to last the rest of your life? Only a year? That is like an alcoholic suggesting they will stop drinking for a year. What happens when they get to the end of the year? Do they go on a bender and come out the other side some 10 years later wondering what happened and how they can get back those last 10 years of their life? An addiction is there for the rest of your life, just waiting to take you down. I think serious consideration must be made at finding you a new hobby. New goals or projects need to be put in place. Unfortunately as a style blogger it only increases your addiction. Hahaha!! I haven’t a CLUE who you are talking about, Suzanne. I tried remedy 1 with CHIPS!! and booze, and then it magically segued into remedy 3 of binge-watching The Crown. Then I went back to sorting clothes but the voice in my head had a very upper-crust British accent this time. It makes swearing so refined! Remedy 2, I get as far as the bin but I can’t bear to light it. I dance around like a rock star anyway and shout the required spell, “I’m an effing rockstar, who’s your momma now? !” Even then, bearing witness to my stiff-fingered dancing and drunken voice and flying chip crumbs, the clothes do not self-combust. It’s a miracle!! So I have built a shrine to my clothing while I sit at its feet in numb and humble obedience. Tee hee hee! Great post daaaaahling! Suzanne. You are so funny. I read your post. Mixed myself a vodka with a vodka chaser and racked up nice sum on my etsy account (ps. I will buy the next wild maxi in my size that you list in your shop. Just sayin..) I agree with Ally. There are no small wardrobes. Only small closets. Love you.